"Third time lucky," or "third time's the charm," suggests previous disappointment and my GFNY experience in 2015 and 2016 had been far from disasters. 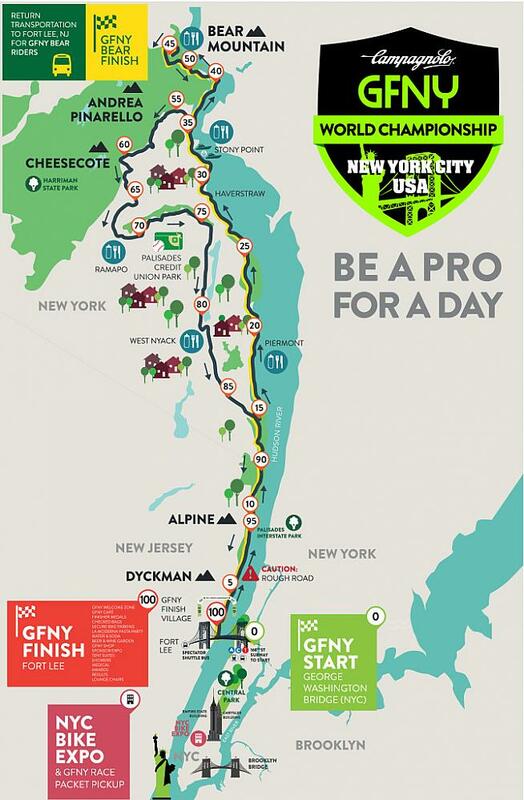 The Campagnolo GFNY World Championship is a superbly well organized marquee event with great police marshalling, a massive international field on a challenging course starting from Manhattan— it's always going to be good. This year, however, the cycling gods showered their benevolence in my direction and were looking after me from start to finish. Perhaps the right phrase is "It's better to be lucky than good". 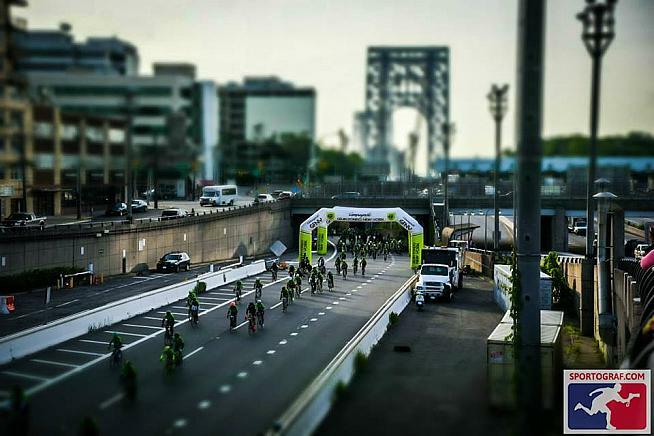 The really good riders covered the 101 miles/162 kms alongside the Hudson from the GWB to Bear Mountain and back to Fort Lee, NJ, in just under 4:30. I took just under an hour and a half more than that, putting me 516th out of 2,670 overall. Pretty pleasing for a middle-aged man with "big bones" that don't help up the 8,500 feet/2,600 meters of climbing. The goal had been six hours and I had almost seven minutes to spare when I rolled into the finish in Fort Lee. Where's the beer tent? Luck comes, of course, in many forms — how training has gone, punctures/mechanicals/crashes, success in finding riding companions, running out of fluids and those inexplicable bad-legs-days to name but a few. In 2017, it all lined up. The worst that happened was I stupidly put a not-quite-empty gel packet in the same pocket as my phone and I felt a twinge of cramp (that subsided) with two miles/3kms to go. It was weather that required a good zipper on your jersey. Zip up for descents and fast flat sections, then pull down to let out the heat as soon as you started to climb. 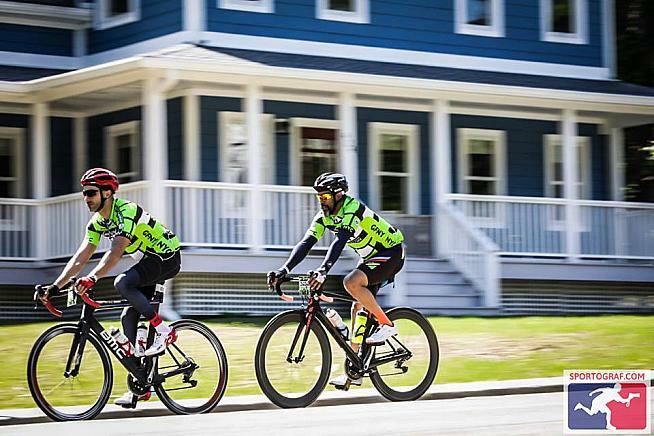 The zippper on the obligatory green GFNY jersey passed the test. The pockets did seem a bit small though and might explain the number of flapping numbers as retrieving stuff from pockets stretched material and ripped the corners of the numbers. 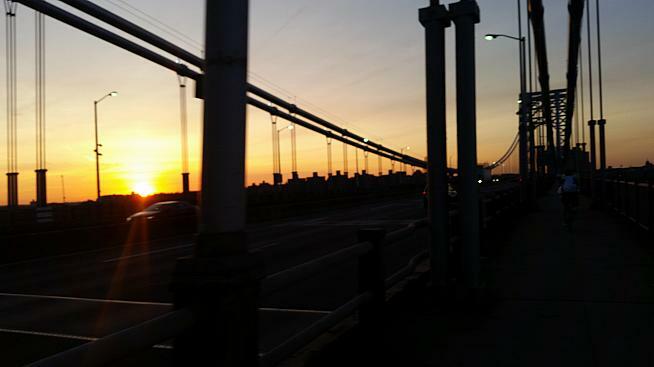 It was then just a question of the run along the bottom in Palisades Park, which always seems much longer than it should be, the climb up Dyckman Hill and the flattish run to the finish line. I did not have a computer on the handlebars and the last check of my (sticky) phone came at Ramapo. I broke into the broadest of grins as the cheers from the crowd at the finish became audible and the clock at the line came into focus with a 5 at the start. Having the line alongside the post-race party meant the atmosphere there was great and a big improvement on previous years when it was a little way up the road. Camila Cortes won yet another GFNY title on the women's side by a clear two minutes from Marcella Toldi in 4:45:30 with Maria Camilla Giannella in third 11 minutes behind the winner. Starting in the front pen I was just 18 seconds behind Pichetta and Cortes over the start line as the usual blend of nerves, overenthusiasm and riders struggling to clip in made life exciting. I was always going to have the racers roaring past early on and so it was through the winding crit-like corners before the descent into Palisades Park and then through the Park itself before the first climb up Alpine. The human brain is a curious object and I spent the two and a half days between my last ride and GFNY imagining niggles, pulls and ligament damage every time I stepped off a sidewalk, climbed stairs or hoisted a bag. Thankfully, the legs felt good at the top of Alpine and I was where I wanted to be. Pretty soon I was on a wheel as a paceline formed on 9W North. After a few minutes a bigger train caught and swalloed us up and then proceeded to absorb a succession of other groups. It was fast and furious and ate up the miles. When pretty much everyone around you is thinner, younger and clearly faster it can go either way. For a while it was the perfect spot, but eventually I had to decide between burning matches to hang on or letting go. Thinking the turn and winding descent to Piermont was not far ahead, and with 85 miles to go, I chose discretion over valor and let the group pull away. The turn was a bit farther down the road than expected and I found myself in the extraordinary position of being not many miles into an event with a field of thousands and quite alone on the road. Literally not a soul in sight. That did not last for long and along River Road the field started to coalesce like blobs of mercury coming together to form a single flowing mass. The peloton grew as we passed through Nyack and for the last 10 miles to Bear Mountain I would guess we were approaching 150 strong, five or six wide across the road. In a group that sticks together you start to notice the riders around you as you move about in the pack and the odd short chat, compliment or joke is shared. There was the cheerful man with neon pink shorts, the South American lady with a white wind jacket, the rider with Ironman tattoo and Brazil arm warmers, the fellow Lynskey rider, the tall guy with aero bars and a bell he rang twice for hazards, and the big chap who was an absolute locomotive on the flat and downhill, but inevitably struggled climbing. The most frequent comment was a variation of: "Wow, this is a great group!" With a worldwide series of events feeding into the New York event, it is no surprise that there are many riders from from outside the United States. The international mix — from 97 countries no less — was clear on the road and snippets of all sorts of languages floated about the group. 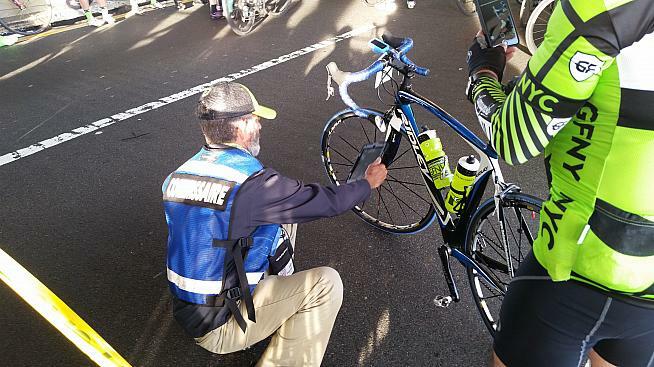 Luckily (there we go again), the cycling language of signaling warnings and calling out hazards crosses borders and the standard of bike handling struck me as high. An exception came at the Stony Point feed station when the inevitable confusion of people pulling over to stop while others get back on the road was amplified by the volunteers handing supplies to moving riders, which I don't think I saw last year. Very pro, but it prompted some ill-advised swerving from one side of the road to the other to grab half a banana. The only other moments of alarm came when a number of people felt they just had to move up in the group and to do so moved onto the opposite lane of 9W, which was open to traffic. Cue inevitable panic when cars appeared. It was so unnecessary. The group started to break up on Baby Bear, the last climb before Bear Mountain, and continued to do so on the descent the other side. Though the group was no more, later on as we passed and repassed each other heading to the finish line a vocabulary of little waves and comments evolved as we recognized one another and offered mutual encouragement. Bear Mountain went well. Arm warmers stuffed into a pocket, I certainly passed more people that I was passed by. 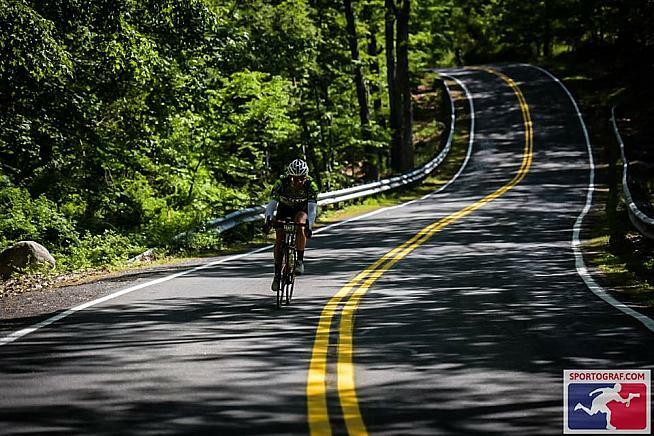 The great thing about being on top of Bear Mountain is that there's only one way to go — down. Zip Up! On the GFNY course what goes down usually goes back up again and the climb back over Baby Bear arrived quickly. Zip down. A small group formed behind me on the climb and we worked together until Mott Farm Road at 54 miles where the course headed inland from the river and steeply up again. The Pinarello climb and Cheescote followed over the next 10 miles in the toughest section of the course. At the top of Cheesecote a young buck in full aero shades had pulled alongside "forcing" me to up my pace to beat him to the summit and we then traded places a couple of times on the descent as his youthful enthusiasm was beaten out by my mass. He and I ended up pulling a bunch along until we rode away from it without noticing. We rotated really well through to the Ramapo feed stop where we exchanged "nice works" as sadly he carried on and I turned in to top up bottles and force in some carbs. In front of tables groaning with energy-rich food, drink and gels I actually ended up eating the PBJ sandwich I had carried all the way from the GWB. If I had carried it all the way around it would have been a waste. Despite the huge calorie deficit built up, I didn't feel like eating when I had finished. A couple of cheeky beers in the beer garden of the buzzing post-race festival started the recovery process successfully and I set off for home intent on buying a couple of lottery tickets to test how long my luck would last. The GFNY World series continues to expand. 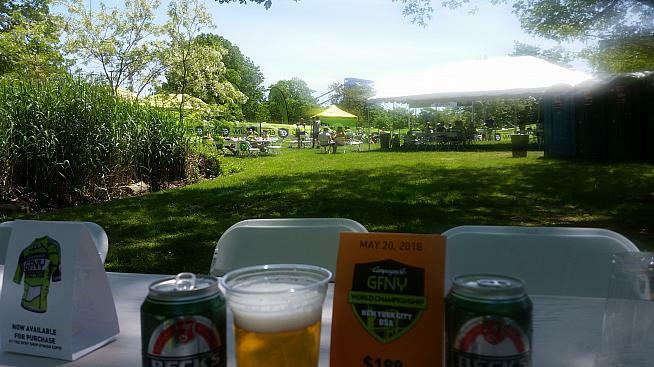 Jerusalem, Bali, Monterrey and Costa Rica have already been confirmed as new venues for 2018 with another five events promised to bring the series to 19 stops and the grandaddy itself, GFNY. 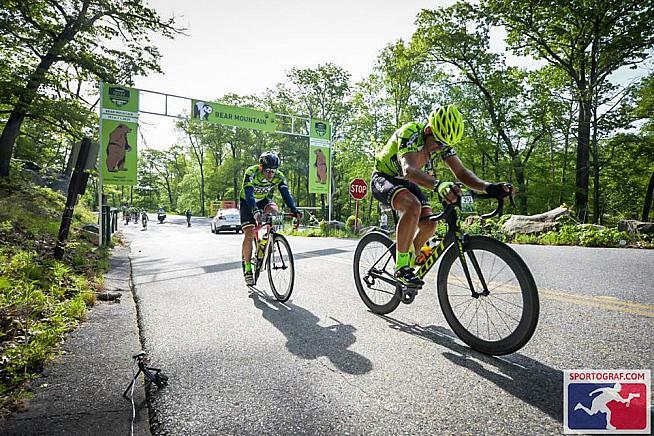 The New York finale refines its impressive offering each year and must rank among the top amateur cycling events globally. If it's on your bucket list, book early to keep down the cost and get to New York City. If it is not on your list it should be. Try your luck.